I’ve been skydiving, shark diving, climbed the stairway to heaven forwards, and in reverse, but I can truly say my experience with “Restaurant Reality” was the most exciting, inspiring, humbling experience of my life. To call it “Restaurant Reality” is slightly a far shot because we felt like we stepped into a magical world far from reality, into something greater than ourselves. 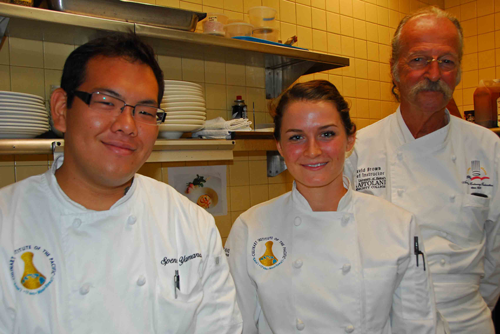 Hawaii Culinary Foundation, Kapi’olani Community College, and Chef Mavro’s restaurant have something amazing going on, enriching the lives of culinarians across the map. I feel so fortunate to be chosen by some of the best Chef instructors in the world to participate in this amazing experience. Exciting would be a basic word to describe the feeling of “how did I get so lucky to be here? !” that I had every hour spent with Chef Mavrothalassitis, and the bunch. Inspiring would be a simple concept to describe the feeling of a small tear being brought to your eye when you hear pure passion in Chef Mavro and his team’s voice. Humbling is an understatement, because after the best two days with the people apart of Restaurant Reality, all I wanted to do was run to the labs at school, run into work and implement all the things I learned. We started our first day in the dining room at Chef Mavro’s. We got to learn about the amazing things the Hawaii Culinary Foundation does. We talked to Chef Mavro about everything culinary, and he introduced us to his staff, which in just 10 minutes shined like stars. They were each very inspiring, and you could see why he chose them specifically, from a head Chef who was turned away by Chef Mavro many times until Chef knew he was completely ready for the task at hand, who showed perseverance for what you want will get you there in the best path possible, to a pastry chef who was called to work before he even himself knew he was ready, but turned out to be the best possible choice for a pastry chef, especially at 24 years old. We spent our first day under the roof of Chef Mavro’s restaurant, and by the second day we were able to see what makes the kitchen so successful. We saw mutual respect for all, from a hard working dish washer, to high expectations for the hostess. The kitchen staff truly trusted the small group of people working around them, and they moved like dancers in a great ballet, every movement had a reason, every step was thought out. With one person working per station, they owned their stations, something every kitchen needs, something I want for the kitchen I currently work in. The staff was amazingly humble, including Chef Mavro, we were happy to learn so much from them in two days which felt like two weeks, but also two minutes. The second day we experienced family owned, 3rd generation run, Sumida Watercress Farm. It was amazing to see the love that goes into one simple, amazing piece of vegetable. It was beautiful to see what the farmer, David Sumida had to do to keep his product amazing. We have a lot of respect for farmers like Mr.Sumida, and we see the shine in Chef Mavro’s eyes when he talks about the farm and the product as well. Next we went to the new location for the brain and heart of Honolulu Coffee Company. Our eyes were opened to another aspect of the culinary world, and the main focus for myself, was product, if you love your product, and you choose the best product, you will get amazing results, the coffee company gets those amazing results. We were led on the first tour by Director Jon Chadwick in the new building that hasn’t even finished its plan, but was gracious enough to let us get in their way and take up their time to show us something they are passionate about. He educated us about what makes their product the best: love for what they do, and only providing the best to their coffee plants, their employees and most importantly, their customers. We met Row Aczon, the director of coffee quality, he showed us what makes great coffee great, and happily made us the best cups of coffee we have ever had. Next we saw their bakeshop which provided us the best macaroon pairing with coffee that we have ever had, and saw their production kitchen, which was beautiful, seeing the care and passion Chef Curtis Horka has for his kitchen and the products they push out, was eye opening. 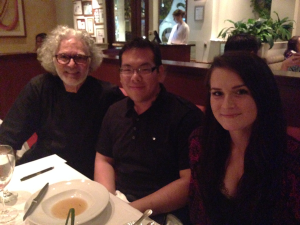 When Chef Alan Tsuchiyama approached me with an offer to stage at Chef Mavro’s Restaurant I was very hesitant. I had two reasons one of which was effected by my current work schedule and nervous about being in a new kitchen. I must say that today I am very jubilant that I decided to say yes and follow through with the decision. The day started off very casually, I got ready checking my knife bag and making sure my coat was spotless. It felt very much like the first day I went to school as a child and one does not easily forget that feeling. We arrived at the door and well my anxiety taking control of my head mentally prepared itself for the monotonous peeling of vegetables and the silence of being shoved to the side because I have somehow became an obstacle. Yet the moment the door opened that feeling vanished, the kitchen’s atmosphere was so warm and inviting. When Chef Mavro says that this is his home that he works with his family he means it when most do not. He was working on fixing a broken mixer an undertaking that is so subtle in symbolism however so mind opening. Being a chef we work on food, on people, on satisfaction however I believe we should also be committed to learning about our tools and how to fix them when they go awry. We are welcomed to take a seat in his dining room and we introduce ourselves. This is the beginning to a very ground breaking moment in my life, a moment that I will carry with me until the day I die as a young culinarian. I laughed because a lightbulb clicked; I remember eating a flower on a plate and it tasting foul, a kind of thorn in the taste of the dish. We worked alongside the staff and although everyone had their positions some more prestigious than the other there was nothing but respect, everyone was professional and from an outside point of view I really just saw a kitchen of Chefs working together. 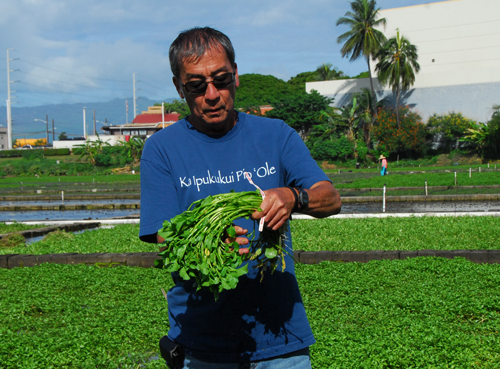 The next day we were able to go to Sumida watercress farms, the owner David Sumida is such a humble man, the amount of work that he puts in with his sister Barbara Sumida put in to supply the demand for watercress in Hawaii is astounding. They produce over 75% of the water crest in Hawaii and although they are undergoing a hard time due to weather they are so patient and optimistic that things will turn out. We were able to see that they had bird net covering some of the younger watercress plants they told us that it was an experiment to see if the bird net would keep the watercress cool enough for growth. I loved to see that although they have been stricken by un-fortune the farms David and Barbara Sumida are constantly adapting to the situation much like what we have to do also. We ended up at Honolulu Coffee Company’s new location and it was purely magical, I believe Keira and I were so lost in the awe of it all. We were treated with the upmost care and were given the full rundown of the operation they are going to execute on October 1st. They are so ambitious and confident in their endeavor that I know it will succeed. It is great to see that they explain their roots and humble beginnings they almost let the coffee and the food speak for them instead. To see everyone here setting up shop and becoming so enthusiastic in the launch is really inspiring, I hope to see myself the same way one day when I open up very own restaurant. The day ended at Chef Mavro’s restaurant we were not in chef whites but instead in clothes suitable to a dinner at such a high end location. Eating the dishes and tasting the wine became so full circle, within my very limited knowledge about cuisine and how they are paired with wines I never really viewed wine as a necessity to a meal that is however until I dined. Even now I am salivating imagining the Meli Melo dish paired with the Dog Point Sauvignon Blanc, Chef David Brown and I exclaimed that the salad was delicious however we were only experiencing half the dish, because the other half was located in this crystal glass filled with the wine that became a salad dressing. Ultimately although it we spent only two days within the culture of George Mavrothalassitis and it was an eye-opening experience because up until now my whole culinary world was perceived through a funnel. Now that I have gotten a taste of the deliciousness called Chef Mavro’s on South King Street I must return to learn more, to add such an irreplaceable tool under my belt that I will apply throughout my career.